To monitor data coming from the hardware, please follow the steps below. First connect your device to the PC according to the instruction provided in the Race Technology knowledgebase. Finally use "File -> Connect to <device>" command to established the connection. It is worth noting that the baud rate of all RT products when supplied is 115200. This will only alter if specifically set by the user. Live monitor supports four types of connections to connect your device to monitor data. 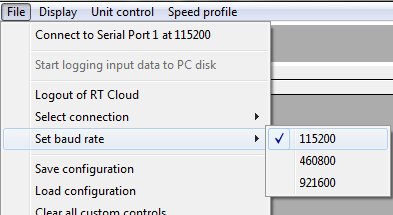 Once the file menu is open, the first sub menu item, �Connect to xxxxxxxx at 115200� shows the last used connection method and the baud rate used. To change the connection method select �Select connection� menu item and select the appropriate method from the sub menus. If you select Serial, USB, or Bluetooth, Live monitor will ask you whether you want to connect right now. If you press �Yes� Live monitor will be connected to your device and will start monitoring data.